Well this is a report that I didn’t want to write. We lost a great man this last week – he was my fishing partner; business partner; and my Mexico fishing partner. We spent a lot of time together over the years, we had good times and bad times, but I could always count on him to be there for me. He always had great ideas and sometimes even some bad ones but it was always good for fishing and fishing tournaments at Grand Lake. He was the man that brought a lot of business to Grand Lake and even introduced guide fishing to Grand Lake. It is with a heavy heart that I tell you that Ivan Martin passed away May 9, 2015. He was a great father, husband, and a great fisherman. Everyone new Ivan and he will always be missed around Grand Lake. RIP, Ivan I and everyone else will miss you. Large mouth has gotten tough since the spawn is over. They should be moving to the points. Try top water, wobble head with a biffle bug and shaky head on main lake points. 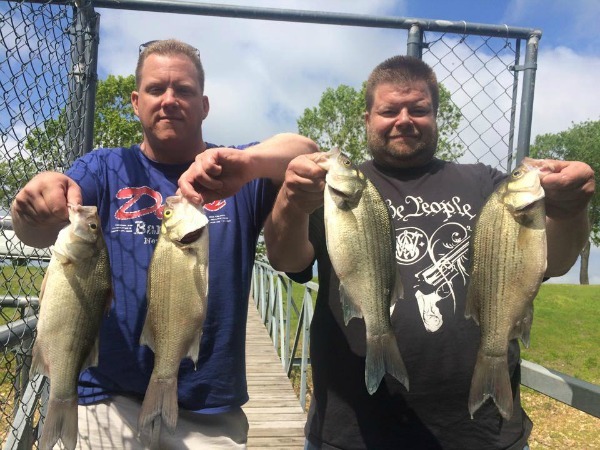 White bass – been catching them really good on spoons silver rainbow minnow, mouth of the rivers like Horse Creek, Elk River and Honey Creek. Crappie – some people are still catching some but the spawn is pretty much over. They should be moving to the deep brush piles. Catfish are starting to bite since the water is rising. Spoonbill are jumping every where. Until next time….Good Luck Fishing from Tony Coatney!